Deborah Lovely (b. 1983) admits that when she first started lifting weights, she was not aiming to represent her country at the Olympics in that sport. 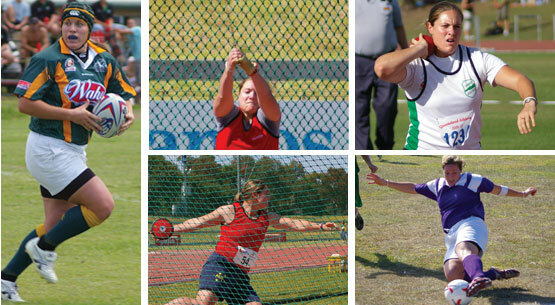 She had simply wanted to improve her strength in hopes it might benefit her other sporting pursuits—especially the discus. So what drives her to endure the arduous hours of training, week in, week out—is it for the glory of proving she is the ‘fittest’ of her ‘race’, in classic Darwinian fashion? Certainly not, says Deborah, a committed Christian—though you could be forgiven for not knowing that, for news reports3,4 of her successes sometimes edit out Deborah’s unashamed acknowledging of Jesus Christ during her post-meet interviews. But she overcomes media ‘censorship’ of her love for the Lord through her own website5 and by strategically using her high profile as a successful sportswoman to take a message of hope directly to those who need to hear it. That’s the single biggest change in Deborah’s life resulting from her sporting victories—invitations for her to address schools and youth camps/events now come from far and wide. But doesn’t she mind having to drive, say, for two hours each way just to speak to kids on camp for half an hour, all with no remuneration? ‘The fact is, I have been blessed a lot, so that means I need to give (do) more. The big increase in speaking engagements is wearying, but I’m even more grateful to God, because of having been given that extra responsibility—it’s a privilege, not a chore.’ Deborah has recently joined a Christian radio network’s Cool Choices team, which visits schools and teaches kids about ‘making good life choices’. Deborah helps out every year as a youth leader on a Christian ‘outreach’ summer camp, and she says that ‘there’s always lots of questions about creation/evolution from kids who don’t attend church. Deborah laughs at the notion that we’ve evolved, pointing out that she herself is a real-life demonstration against evolution. And not just kids. Adults, too, have questions. I said, ‘What about the abortion laws?’, and that shut them up. 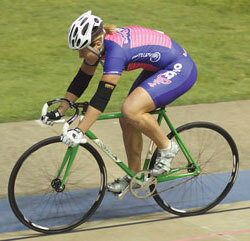 In cycling, Deborah won the 2005 Queensland open Keirin title, as well as winning gold medals in the 1 Lap Time Trial and Team Sprint. As well as the many hours per week spent in physical training, and the increasing number of speaking engagements, Deborah somehow finds time to serve in the music team7 at the local church, and is a full-time student at Griffith University (Brisbane, Queensland). Accusations against Christianity pop up everywhere, it seems. One of the prescribed texts claimed that Christianity was responsible for domestic violence. So Deborah refuted that in her research assignment, which she then submitted for assessment—and passed! Maybe they felt intimidated, wondering if I was about to pick them up and throw them! She remembers one occasion in particular when the lecturer made derogatory comments about references to the Bible in Law, e.g. saying something to the effect that ‘it’s just a throwback from history’. Deborah then went up boldly to the lecturer and stated that according to university policy (relating to all forms of discrimination), the lecturer’s statements were highly inappropriate. The lecturer then apologised to all the students in the lecture theatre! Journalists love it when ‘celebrities’ share such personal ‘human interest’ anecdotes. But in stark contrast, news reports of her successes sometimes edit out Deborah’s unashamed acknowledging of Jesus Christ during her post-meet interviews. It’s clear that Deborah is passionate about issues of law and society, recognizing the gravity of the situation facing the (formerly Christian) West. ‘In our Western democracies, we see that the people with the loudest voice are getting the laws changed; they’re the ones who don’t want to have Christian laws any more. Even in my short lifetime I’ve seen big changes. I asked Deborah about the number of Christians in top-level sport. ‘Sometimes it feels like I’m one of the only ones,’ she said, ‘but joining the Cool Choices team was so encouraging—to meet Shaun Hart [footballer] and Fiona Cullen [hurdler]—to know that there are Christian athletes that I don’t often come across. ‘Actually, that was the stand-out best highlight for me about going to the Athens Olympics and the Commonwealth Games in Manchester and Melbourne—going to the Worship Services. Queensland Weightlifting Association, <www.qwa.org/Alist/lovely.ASP>. Return to text. Beijing 2008 Olympic Games—Official Site of the 2008 Australian Olympic Team: Ambassador—Deborah Lovely, <www.olympics.com.au/Education/Ambassadors/AmbassadorsDeborahLovely/tabid/326/Default.aspx>, 19 February 2008. Return to text. E.g. (along with ref. 4): Lovely day for weight of gold, The Age (Melbourne), <www.theage.com.au/news/weight-lifting/lovely-day-for-weight-of-gold/2006/03/21/1142703363749.html>, 22 March 2006. Return to text. Malone, P., A Lovely dilemma, The Courier Mail (Brisbane), <www.news.com.au/couriermail/story/0,23739,21278761-10389,00.html>, 23 February 2007. Return to text. 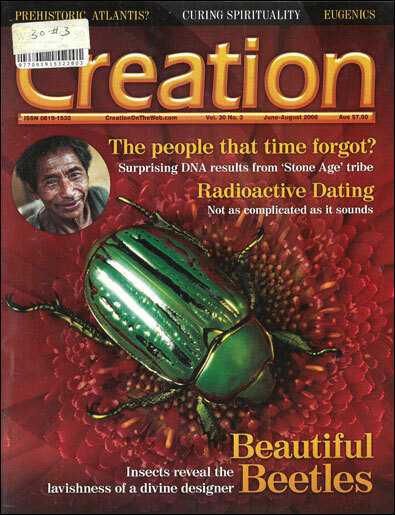 Standing upright for creation: Jonathan Sarfati chats with human spine expert Richard Porter about his science and faith, Creation 25(1):25–27, 2002; <creation.com/porter>. Return to text. Deborah has achieved high-level awards for her piano and saxophone skills—and her friends say she is a ‘pretty handy’ drummer, too. Return to text. For more on this topic, see Zimmermann, A., The Christian foundations of the rule of law in the West: a legacy of liberty and resistance against tyranny, Journal of Creation 19(2):67–73, 2005; <creation.com/law>. Return to text. 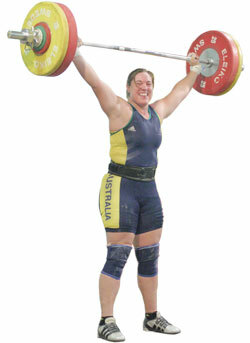 Of course staff would likely be aware of Deborah’s weightlifting prowess—e.g. 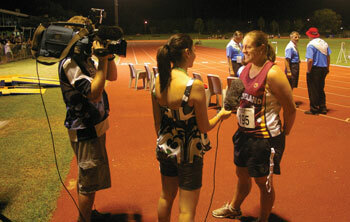 her achievements are profiled on the university’s website: <www.griffith.edu.au/sport/profiles/content_deborah.html>. Return to text.